The Graham era ends at WashPost. Here’s how it began. . . The news of Weymouth’s departure (ouster?) brings to mind the question of how her great-grandfather took over the paper in the first place. As the leading daily paper in the nation’s capital, the Post is a major institution in American journalism — no matter who owns it — so it is worth paying attention to. Such, such were the days — when the Post was immensely profitable. In his first few years as top editor in the 1960s, Ben Bradlee got to expand the newsroom by 50 new positions! Here is an excerpt from my book, Covering America, in which I describe the paper’s takeover by Eugene Meyer, the patriarch of the family that became known as “the Grahams” when his daughter Katharine (cq) surprised everyone by becoming publisher. Given Meyer’s role in Washington, it was a bit like Janet Yellen deciding to buy the Post. father’s objections), then did some freelance reporting for the New York Sun. bidding at $800,000, Meyer got the paper for $825,000. Review and was now clerking at the U.S. Supreme Court. and supervising a household staff that included a nurse, a cook, and a laundress. interest in the CBS radio station WTOP, bringing the Post Company into broadcasting. In 1950 he built a new headquarters for the Post in downtown Washington. During the Kennedy years, the Grahams were reaching an apex of early success. and he began an affair with a young Newsweek staffer, Robin Webb. bolted up and raced around the house looking for Phil. She found him in a bathroom. There must have been blood everywhere. . .
pages” (or “society pages”), where they wrote about weddings, fashion, and casseroles. other industry; in 1960 only 5 percent of all working women were in management. would sell the paper or turn it over to someone else to run. So what she did next came as a surprise. She decided to run the Post herself. reporters had to jockey for space in the paper and for favor in Bradlee’s inner circle. like Cinderella. The media, naturally, had a field day . 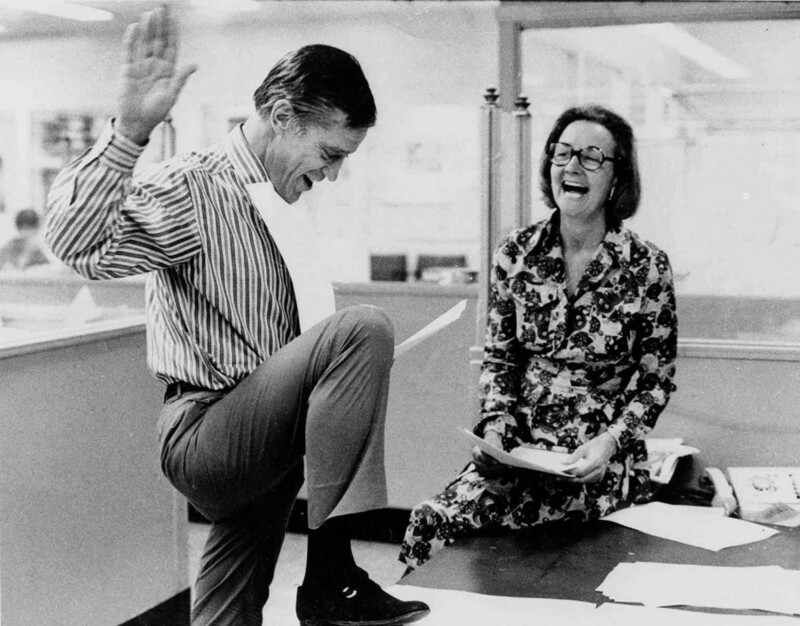 . .
Ben Bradlee and Kay Graham react to the 1971 SCOTUS ruling in the Pentagon Papers case.